An inkle loom? I bet you didn’t expect to see that here! I have been playing with my Ashford inklette this week…but more about that later! I have this star motif memorized now! You would think so after having woven seventeen of them and then another seventeen of the mirrored version. I am really enjoying weaving this wide piece. I love using the big swords and hearing the clacking sound they make as I insert one to hold the picked-up warps while withdrawing the other. I like the feel of the chunky polished wood and I like the look of all those string heddles neatly lined up across the warp. The wideness of the warp which is very close to my body width makes me feel even more that I am part of the loom itself and I like that the opening of the sheds feels more natural now and less of a workout. I guess that I am just over halfway now…at least with the weaving part. I am thinking of finishing it with weft twining and trying to work a similar star pattern into the twining. And then I wouldn’t mind adding a tubular woven band to the edges. So, this may not be truly finished for some time. 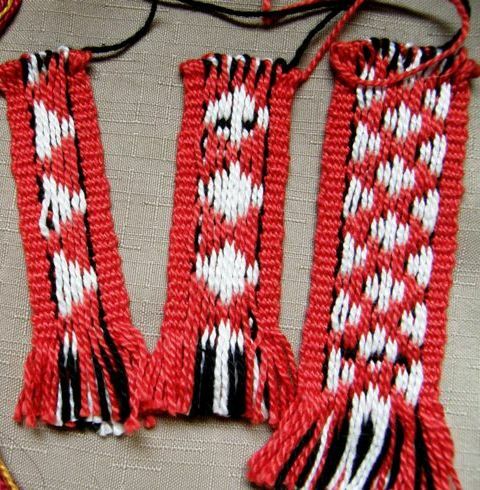 In any case, I am already charting my design for the next piece in this wide red, black and white set and am taking inspiration from the chamantos which are ponchos worn by the huasos of central Chile. 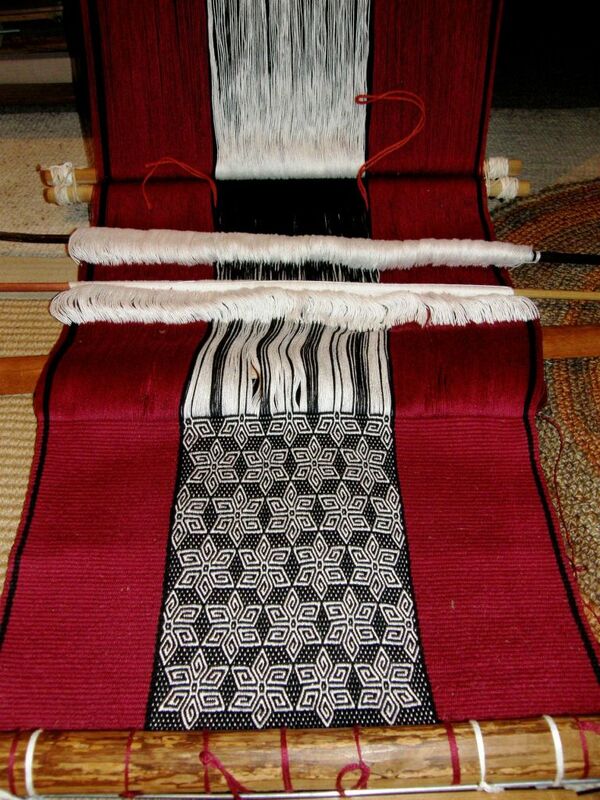 An online friend who lives in Chile has allowed me to use the picture she took of a chamantera at work at her loom. I am excited about this next project as I have not woven designs like these before and can’t wait to see how they turn out. Of course there will be a good deal of sampling beforehand. And I can’t help but think ahead to the next pieces after that! We will be starting a new weave-along in the Ravelry group in January. One of the themes that I have suggested so far is ikat so I will try to incorporate some of that in one of the pieces in this set. Again, much sampling will be done before I try ikat in one of these large pieces. I have only done three or four ikat experiments so far so, naturally, there is still A LOT to be learned . I guess I have been a fan of this bold color scheme for some time. Here’s another pebble piece I made some time ago with these colors. 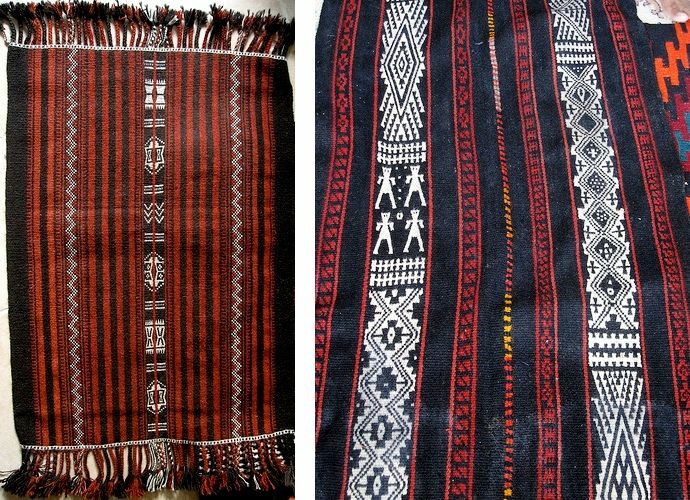 It certainly keeps appearing in my life…the Montagnard weavers use a lot of black which beautifully sets off the red and white twined designs that adorn the edges of their pieces. 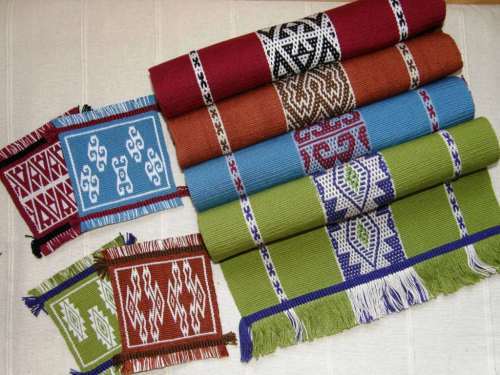 Many of the Bedouin pieces I have seen online and in books make a lot of use of these three colors. My online friend Tracy, who lives in Doha Qatar, is constantly sharing pictures of Bedouin textiles she sees with us on Ravelry . The ones below, which Tracy photographed, are from Oman, (on the left) and Syria. 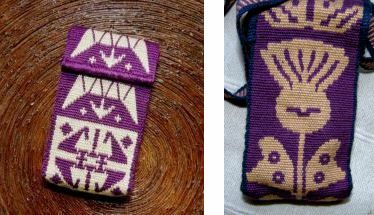 I remember back in 1993 or 1994 when I first went to live in Chile, before I could learn Navajo weaving or make my first trip to Peru, I knocked together a wooden frame, hammered in some nails and made some small tapestries using a cardboard rigid heddle, (it wasn’t very rigid!) cotton warp and acrylic weft yarn. 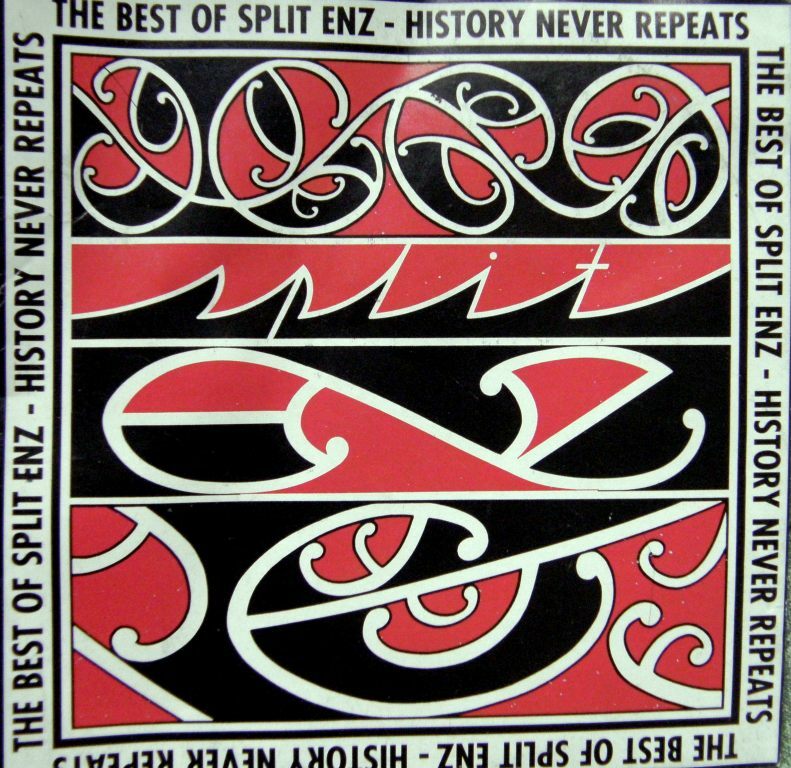 I had no resources at the time and all I knew was that I wanted to weave something “ethnic” and so the cover of the Split Enz CD with its Maori designs was my inspiration! I made a small tapestry pillow cover using the motifs. I so wish I still had those early weavings. Many things got left behind when I moved up to Bolivia. Only last month I was in the library of the Textile Museum in DC and found a book with charts of a lot of twined Maori pieces including ones with very similar designs to those on that old CD cover. I expect I will be making something with those one of these days. There are a lot of curves in those Maori motifs and that is one thing I learned from twining letters…it is not too difficult to make figures with curves. That’s another reason to love the warp substitution technique whether it be the single layer or the double-weave version…with enough threads to work with, you can produce all kinds of shapes. I have been sampling for a future double-weave project and trying to get the scale sorted out for the #10 crochet cotton that I want to use. For example, I have been trying to figure the ratio of warps to weft shots to make a square, sampling to see how the thickness of a two-warp vertical line compares to that of a single weft-shot horizontal line among other considerations. Again…I am just loving the backstrap loom and the way it enables me to make small samples. At left you can see the Abba Yohanni motif that I wove some time ago. The original card-woven motif on the curtain in the cave church in Ethiopia is pretty much square whereas you can see that mine is elongated. Can you tell that I didn’t sample before I wove this motif into the wall hanging? The solution was pretty easy after all. All that was needed was to weave only one row for the horizontal lines instead of two and that was enough to change it into a more square-ish figure. Below is the improved Abba Yohanni motif now looking more like it should. The diamonds in the four corners are my own invention. Figures that comprise pure horizontals and verticals are fairly easy to chart and I have been finding other interesting knot-like designs with these features online. It’s the curves that are troublesome!…trying to get the horizontals and verticals to behave in such a way that they give the illusion of a curve. Even getting the right angle for diagonals can be challenging. It seems that the vast majority of Celtic knot designs in my books include these pesky curves. Fortunately I really like messing around with these kinds of things. I went through all this when I did tapestry weaving in Chile and was trying to figure out how to make just the right angles for diagonals so that I could weave the design on a Mexican piece that I had seen in Joanne Hall’s book. The resulting piece is at left. I would have used red for the background, to have my favored red, black and white combo, except that my Wild and Woolly yarn order to Chile somehow got messed up and that pinky color arrived instead of the Ganado Red that I had wanted. So, I have been sampling…only one sample done so far and still a long way to go to get the desired result but I expect I have learned enough from this to get it pretty close to right next time. Yes, I love double weave…those clean crisp designs on the solid color backgrounds on both faces. It is, after all, just two layers of plain warp-faced weaving with substituted warps. It is easy to chart and I find it one of the easiest patterning techniques to “read” as I weave. I have had a lot of fun using it for African and South American inspired motifs…. …as well as designs from Mexico (again from Joanne Hall’s book). Supplementary weft inlay motifs like the ones from Bhutan on the bag I made above right can be easily woven in double weave. 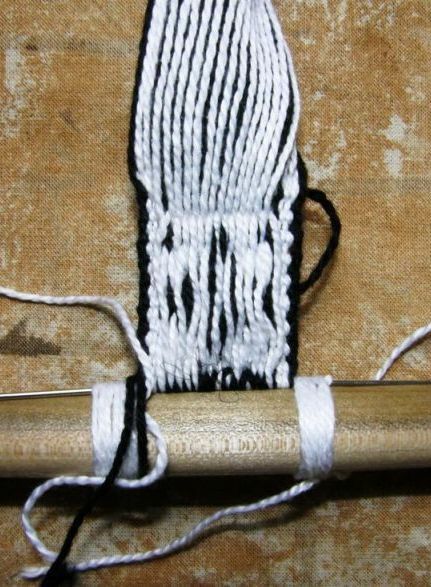 They conveniently use exactly the same charting system (although the reverse is not always true, that is, not all double weave designs will translate well into inlay as the floats in the inlay technique need to be kept short). I have been able to take elements of motifs woven in other techniques like the simple warp float patterns I wove on the placemats above and weave them into matching mug rugs in double weave. Cell phone pouches are nice double weave projects. 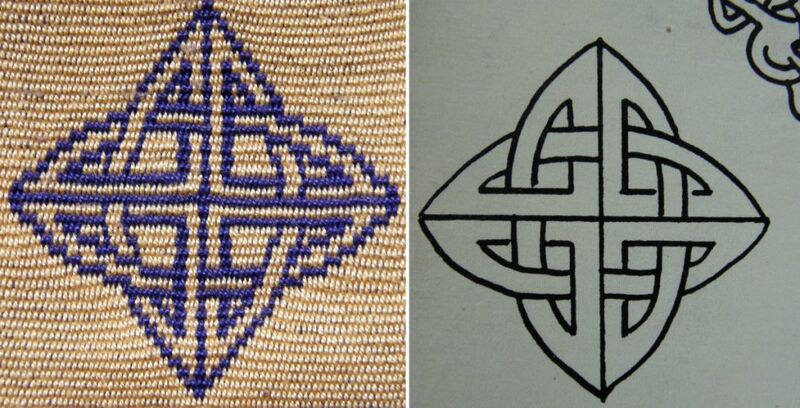 The designs on the one on the right, which are based on Guarani motifs, are quite curvy. 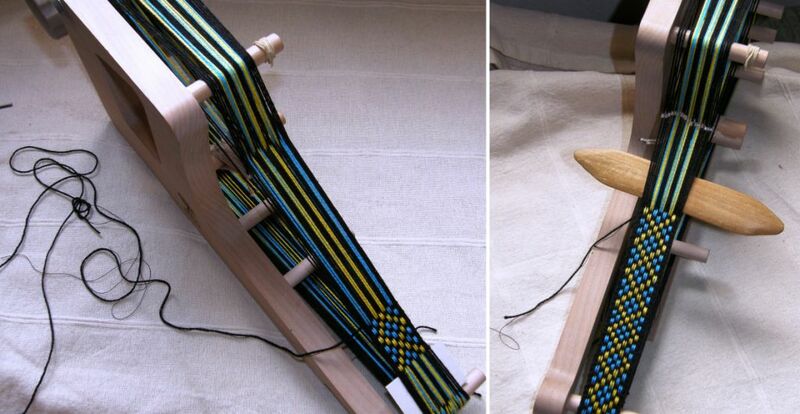 Here are a couple of projects made by my online weaving friends Traudi and Sharon. Traudi charted and wove the designs on her green and yellow mug rugs. 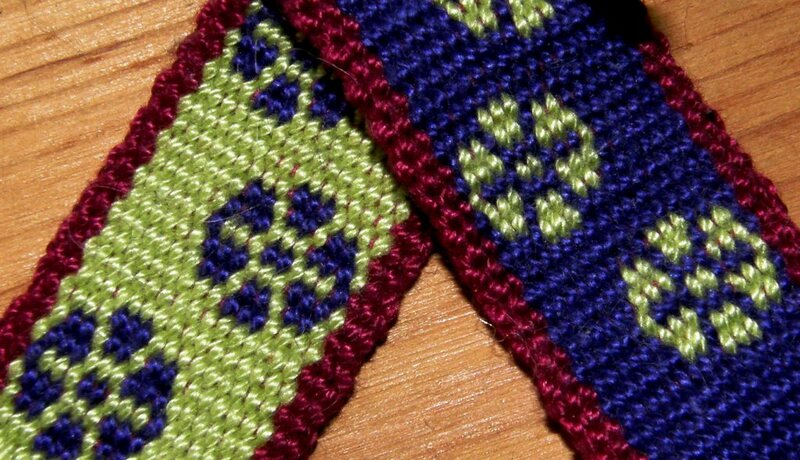 Sharon created a series of butterfly motifs for double weave projects. This is just one of four that she showed me. And how did Traudi reach this point? She started off with the warp substitution technique. 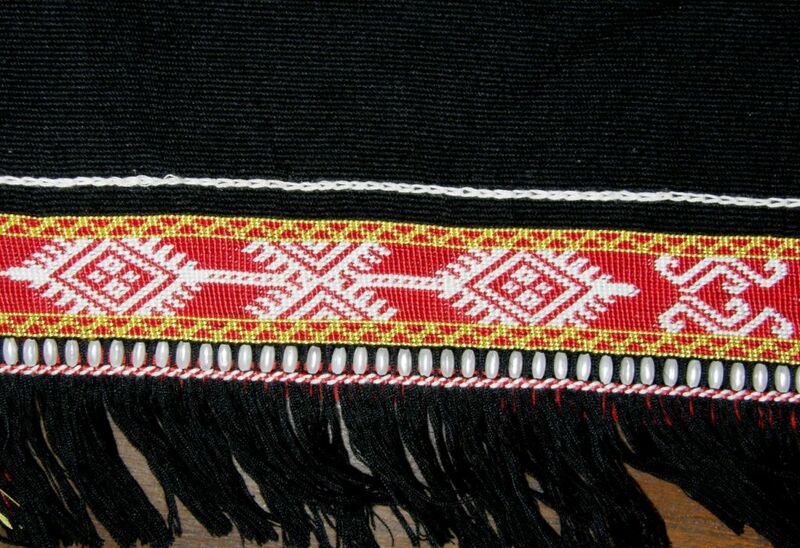 Below you can see a band that she made using the Bedouin shajarah motifs charted here as well as the Bolivian flowers charted on the double weave page. She also created designs of her own. I think that the word “double” in double weave for some people may immediately bring forth ideas of something complex and difficult. In warp-faced weaving, it isn’t! You are basically doing plain weave with two sheds as you would normally, except that you are using doubled threads, one in each of two colors. To create patterns, you simply drop one of the two threads…the color that you don’t want to have appear in your pattern. 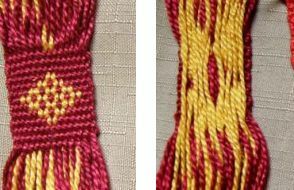 The solid color borders will also be warped with doubled threads as shown above. You only need to drop warps to create the shed for the upper layer. After doing a special maneuver, the pattern shed for the lower layer forms automatically. Only one weft is needed to weave first the upper layer and then the lower. 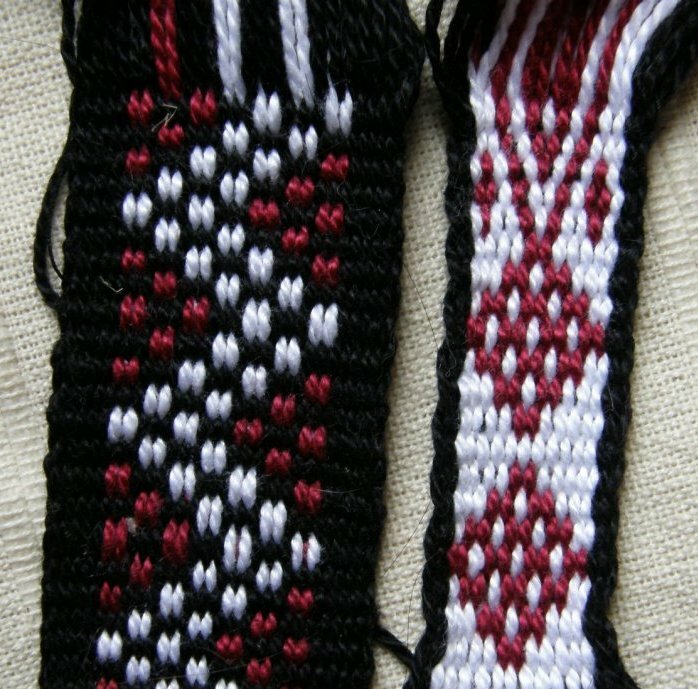 This technique’s “little brother” is the simple warp substitution technique which Traudi used to weave her band. The same kind of warp is used except that the solid color borders are not warped with doubled threads. As in double weave, the pattern shed is created by simply dropping the warps that are not needed to form the design. The warps that are dropped simply hang below. While I recommend the simple warp substitution technique as a good warm-up before moving on to double weave, it is those discarded warps that form long floats on the back of the textile that most people don’t like. I guess that’s the price you pay to have a smooth “float-less” front face on the band. You can see at left how long and awkward the floats can be. 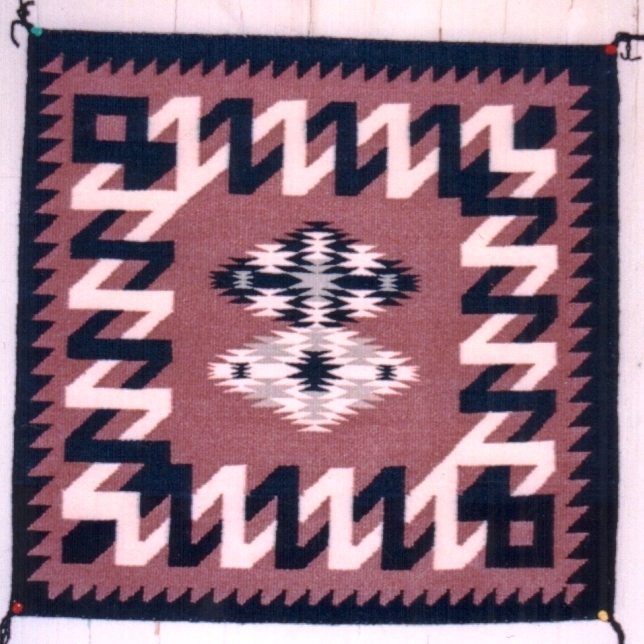 Both the bands of patterning on this piece have been woven with the warp substitution technique. 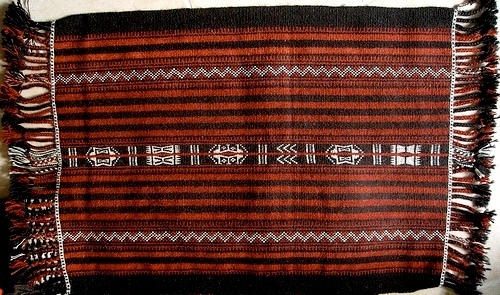 The Bedouin call the style of patterning in the center band shajarah and the checked pattern al’ouerjan. You can see some close-up examples that I wove below. 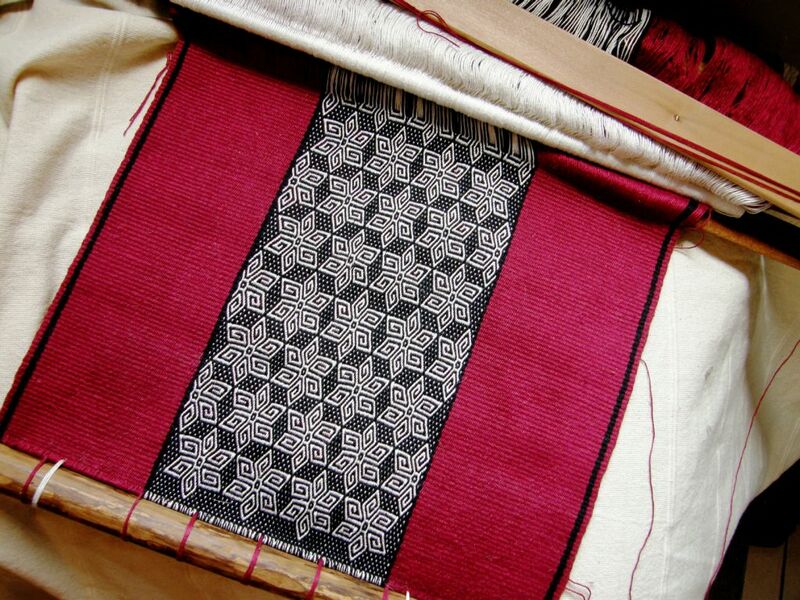 The al’ouerjan pattern is a partial warp substitution design in that only the red and white sections are warped as doubled threads. The blacks are all single warps. My samples would have unsightly floats on the back if Tracy had not shown us the back of the Omani textile which showed how the weavers use a second fine weft to secure the floats. This is the first time that Tracy has seen this in use and she suspects that designers in the cooperative store that sells these weavings are encouraging the weavers to use this second weft to make the textiles more attractive. 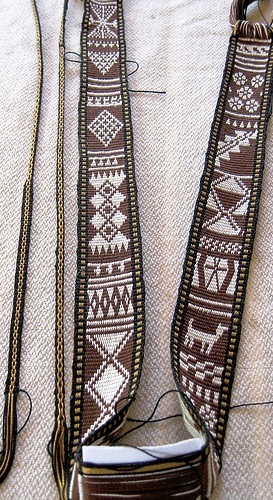 The technique is not used in traditional Bedouin pieces. So here is how it is done…very simple!! I decided to put this on my Ashford inklette, just for something different. Here is the draft…(the split squares show where two threads are wound together as one. The borders are not included). …and I used non traditional colors. Above you can see the cross. 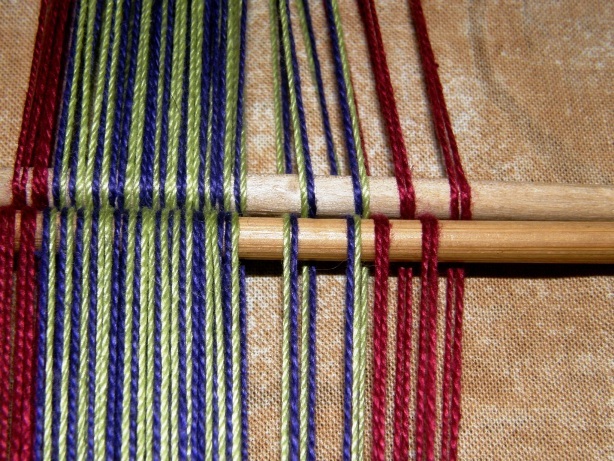 Note that the yellow and blue threads have been warped together as one thread. Above left you can see one of the sheds opened. 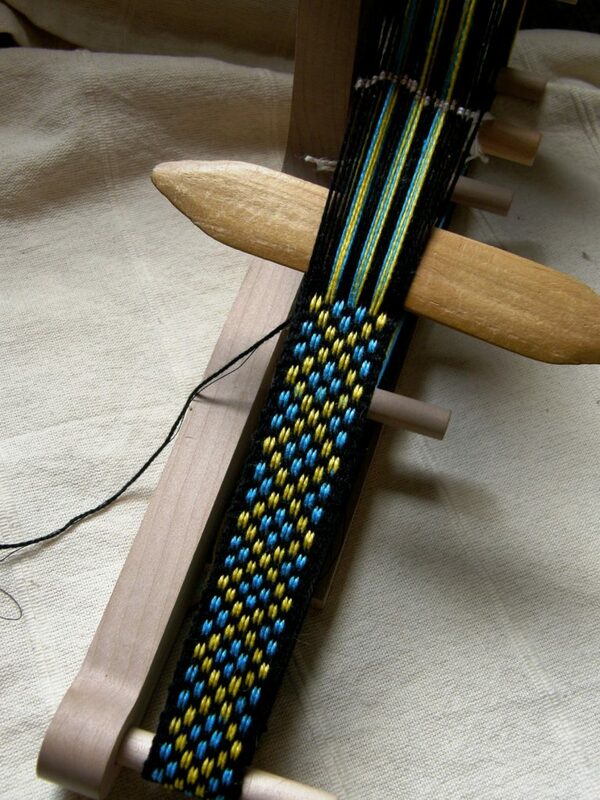 From each pair of yellow and blue warps, one warp must be dropped and one kept to form the pattern shed. 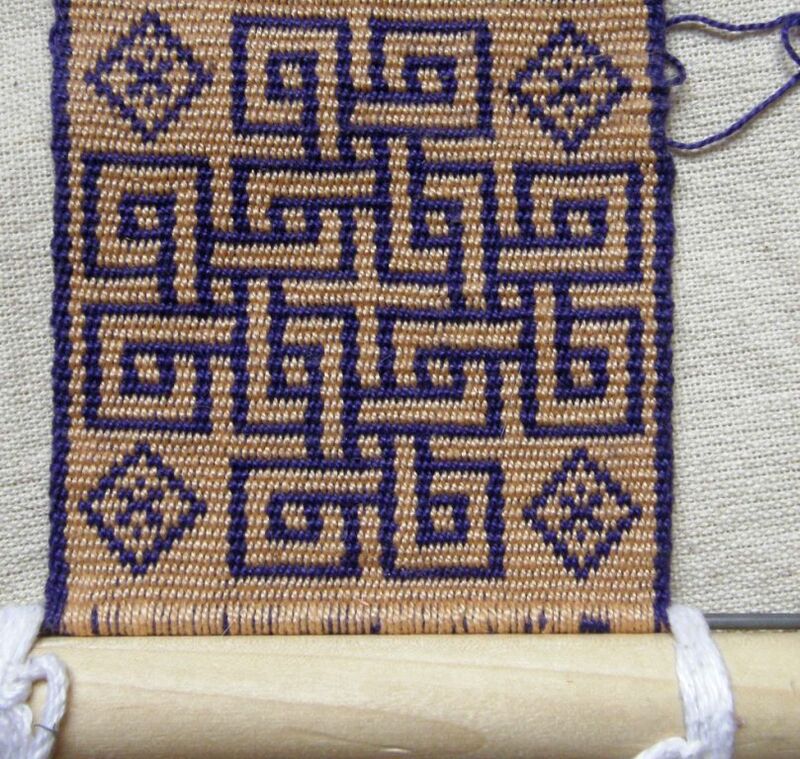 Then the weft is passed as shown above right. And here it is using the system on the Omani co-op textile where the floats have been secured. While the extra weft serves to secure the floats, it doesn’t really create a pretty second face. However, I think that it makes enough difference to enable you to use this patterning technique and create a very much more practical piece even though you would probably still prefer to have the back hidden from view. So, although you may not want to use it for a guitar strap, you may find it works well for a bag or cell phone pouch. You won’t have to worry about things getting caught on the floats. Bear in mind that the resulting band is fairly thick as you are, after all, using doubled threads. I hope that I have inspired you to try this technique. (See the tutorials for simple warp substitution and double weave). Give the simple warp substitution a try and maybe you will be tempted to go on to double weave so you can have two pretty float-less faces. I am in the process of charting more beautiful designs from my friend Pam’s gorgeous rug from Uzbekistan to add to the warp substitution and double weave pages. They will go up soon. Super love the wide pebbleweave piece. It will be totally stunning with twining and tubular edges! Your star piece is absolutely stunning (echoing Jennifer, but it’s the word that came to mind.) Just agog at how beautiful that is. I agree that a wider piece makes you feel more like part of it, and I’m enjoying my wider piece immensely. Get a bit of a sore hand from lifting the heddles, but it’s just muscle-sore from the work, not strained. I’m also baffled by your range of samples – there is too much here to absorb at once! My mind still shies away from double-weave at the moment, but I believe you that it isn’t hard. The step-by-step demonstration of al’ouerjan is very helpful – I will refer back to it the next time I warp one. And the tacking warp also looks easier than I thought. Thank you for everything!! Hola, que hermoso trabajo y la estrella es preciosa, gracias por compartir tus trabajos, experiencias, etc. !!! 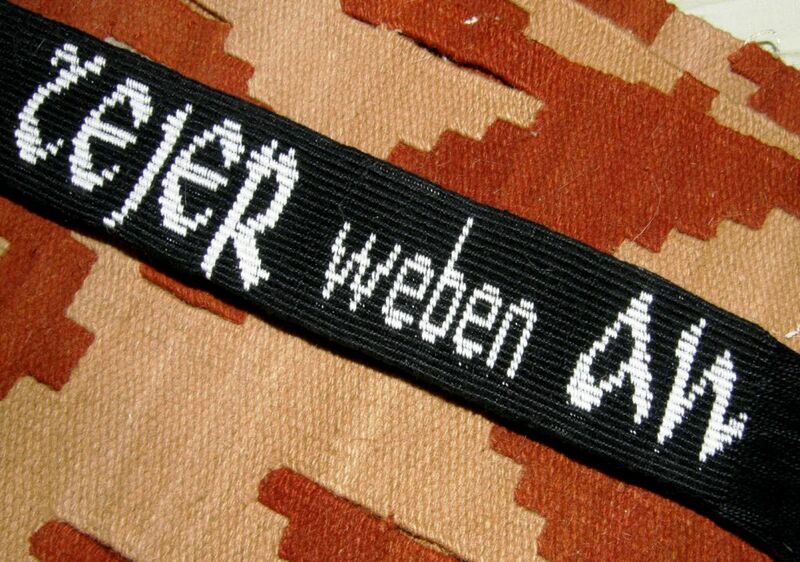 A thinner secondary weft! Score! I have no idea why I didn’t think of this, since I use a secondary weft for overshot. Thank you! Also your star piece is incredible! Love it. I look forward to every post here. You keep a gorgeous, colourful and inspirational blog! going to get a warp done today!!!!!! been procrastinating for too long. I have to say that the colors and the amazing quality of your work in the placemats and coasters is breathtaking! I know you have worked hard and long to acquire the amazing amount of experience you have. Thank you so much for freely and generously sharing much of what you see and know as well as sharing so much of yourself and your time with all of us! What a wonderful inspiration and a true gift your blog is! i love your work it is amazing. 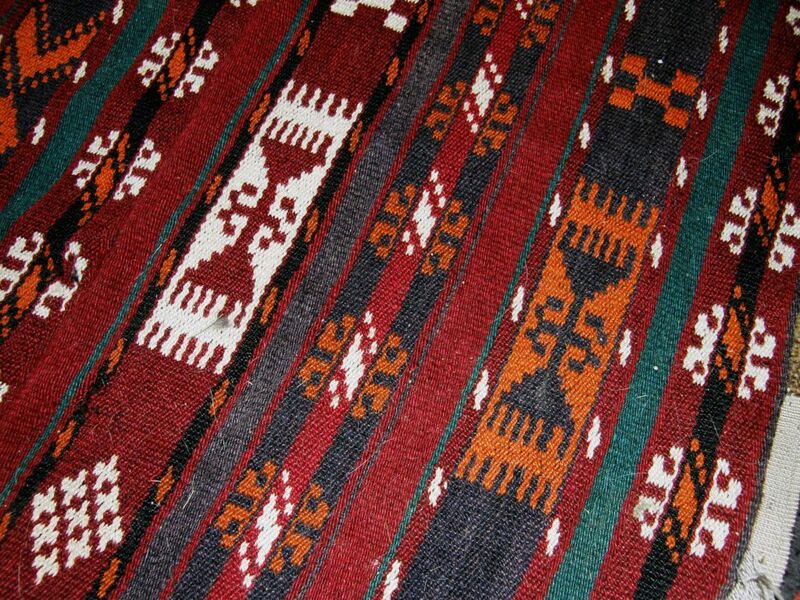 i am Bedouin from syria i live in Dubai and i sale very old Bedouin kilim you can see them in my page .